Troubleshoot Data Blending-Common errors while Data Blending data source. When you use data blending to combine your data from different data sources, there are a few common issues that might arise. This topic lists them and describes how you can respond. Fields cannot be used from the [name of secondary data source] data source, because there is no relationship to the primary data source. In the Data pane, switch to the [name of secondary data source] data source, and click at least one link icon to blend these data sources. For example, suppose you have two data sources that are related by the State and Date fields. At least one of these fields must have the active link icon ( ) next to it in the secondary data source. You can make the link active by clicking the link icon in the Data pane or by using the related field from the primary data source in the view. The secondary data source may not have any relationships to the primary data source. Look in the Data pane for the link icon. Tableau automatically links fields that have the same name. If your fields do not have the same name, you must define a relationship between them. For more information, see Step 4: (Optional) Define or edit relationships . The primary and secondary connections are from tables in the same data source. Instead of linking the connections, use the Data menu to join the data. Joins can integrate data from many tables and may improve performance and filtering. This warning occurs when the workbook contains separate data sources that connect to the same database. 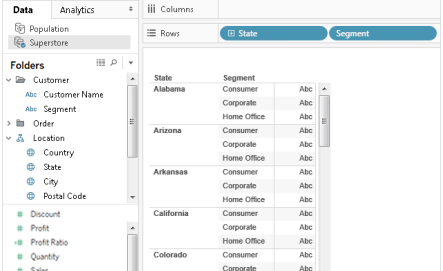 Though you can combine data in this way, Tableau recommends that you use a join to combine data from the same database instead. Joins are typically handled by the database, which means that joins leverage some of the database's native performance capabilities. Data blending has some limitations regarding non-additive aggregates such as COUNTD, MEDIAN, and RAWSQLAGG. Non-additive aggregates are aggregate functions that produce results that cannot be aggregated along a dimension. Instead, the values have to be calculated individually. Cannot blend the secondary data source because one or more fields use an unsupported aggregation. Groups in the primary data source: If a non-additive aggregation from the primary data source is in the view, you cannot use a group created in the primary data source. To work around this limitation, convert the group to a calculated field. Non-additive aggregates from the primary data source: Non-additive aggregates are only supported in the primary data source if the data in the data source comes from a relational database that allows the use of temporary tables. To work around this issue, consider creating an extract of your data source. Extracts support temporary tables. Non-additive aggregates from a multi-connection data source that uses a live connection: Multi-connection data sources that connect to data using a live connection do not support temporary tables. Therefore, using a multi-connection data source that connects to data using a live connection prohibits the use of blending functionality with non-additive aggregates. To work around this issue, consider creating an extract of your multi-connection data source. Extracts support temporary tables. Linking field in the view before the use of an LOD expression: This error can also appear when you use a level of detail expression in a view that uses data blending. To resolve the error, make sure the linking field in the primary data source is in the view before you use an LOD expression from the secondary data source. Published data sources as the primary data source:Because certain versions of Tableau Server does not support temporary tables, there are some limitations around non-additive aggregates. For Tableau 8.3 and earlier, Tableau Server does not support temporary tables. Therefore, using a published data source as your primary data source prohibits the use of the blending functionality with non-additive aggregates. 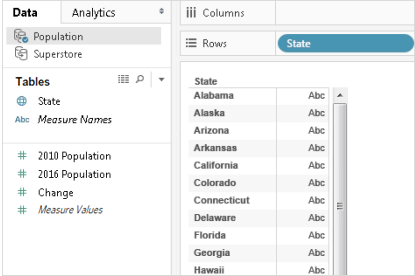 For Tableau 9.0 and later, you can use COUNTD and MEDIAN with blending functionality in a published data source that is used as the primary data source. However, the other limitations listed above still apply. When you blend data, make sure that there is only one matching value in the secondary data source for each mark in the primary data source. If there are multiple matching values, you see an asterisk in the view that results after you blend data.For example, suppose you have two data sources: Population and Superstore. The primary data source, Population, has a field called State. The secondary data source, Superstore, contains fields called State and Segment. In the secondary data source, each state has multiple segments. Alabama, for example, has Consumer, Corporate, and Home Office segments. The secondary data source does not contain values for the corresponding values in the primary data source. The data types of the fields you are blending on are different. The values in the primary and secondary data sources use different casing. Insert data in the secondary data source: Insert missing data in the secondary data source so that all records in the primary data source have a match. For example, suppose your primary data source contains values for all 50 U.S. states, but your secondary data source only has values for 30 U.S. states. To resolve this issue, you can add values for the remaining 20 U.S. states to the underlying data set of the secondary data source. Alternatively, you might be able to Bring a Field into the Primary Data Source or Alias Field Values Using Data Blending to work around null values if you cannot modify the underlying data. Verify data types in the primary and secondary data sources match: For example, both data sources should use string data for the fields you are blending on, or both fields should contain numbers. You can't blend fields where one field contains numbers and the other contains strings. Verify the casing of the values in the primary and secondary data sources match: If one data source uses a mix of upper- and lowercase names, and the other uses only uppercase, you'll see null values. For more information, see Nulls Show When Data Blending. Cube data sources can only be used as the primary data source for blending data in Tableau. They cannot be used as secondary data sources. For other issues that emerge while blending data, see the following links. For issues sorting on a calculated field, see Sorting by Fields is Unavailable for Data Blended Measures. For issues with a computed sort, see Sort Options Not Available from Toolbar When Data Blending. Fields from the secondary data source cannot be added to a URL action. See Fields from Blended Data Source Unavailable for URL Actions. Action filters are not behaving as expected. See Action Filters with Blended Data Not Working as Expected. Invalid fields when using COUNTD, MEDIAN, and RAWSQLAGG. 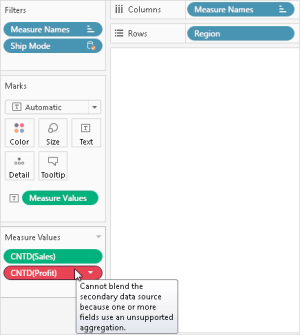 See COUNTD Invalid in Published Data Sources When Blending. Duplicate totals after every date value in the view. See Issues with Blending on Date Fields. Latitude and longitude fields are grayed out. See Error "Invalid field formula" Creating Map. Incorrect results when using an exact date field as the linking field, see Blended Data Displays Incorrectly When Linking on a Date. Underlying data shows different values than blended data. See Underlying Data Not Consistent with Blended Data. Tags: none (add) troubleshoot data blending-common errors. Content tagged with troubleshoot data blending-common errors. 1. Re: Troubleshoot Data Blending-Common errors while Data Blending data source. 2. Re: Troubleshoot Data Blending-Common errors while Data Blending data source. Thanks Chenna for these tips when working on data blending. However, the issue i am facing right now is the counts in my table changes the moment i click on the Active Icon Link that blends a field from 2 data sources. I am not sure what can be the reason. Is there any way, you can provide with any solution or tip?